SOUTH AFRICA - Our Business is God’s Business! You are kindly invited to be part of Women on the Rise International Leadership Conference on the 8 - 9 March 2019 at Charity Christian Fellowship Church, Plot 1 Tweefontein G, in Kwa-Mhlanga, South Africa (Next to Einel Petrol Station). On the 8 March, the program will start at 18:00. On the 9th we will have 2 sessions, that is 10:00 and 14:00. A 2-Day power-packed, inspirational, motivational and educational experience. Dynamic Speakers, Networking, Panel Q & A and Interactive Sessions all prepared to take you to your next level of success. 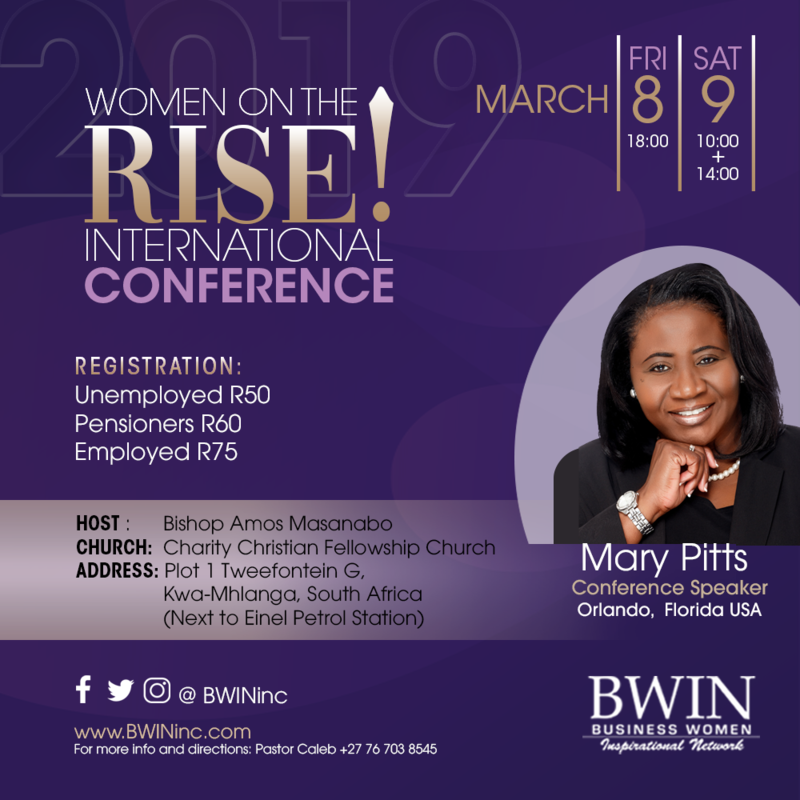 Mary Pitts, the guest keynote speaker and founder of Business Women International Network (BWIN) will cover the following subject: - A woman's place in Ministry, Business and Community. Shaleana Eubanks-Worlds will be one of our workshop speakers. Registration is as follows: RSVP HERE! Don't miss this life-changing opportunity. Make plans to be there! RSVP HERE! Contact Pastor Caleb cell 076 703 8545 for any inquiry and directions.